Emily Vieweg performs her poem ‘Vision’ about Matthew Shepherd. Grand Forks graduate student Glendon Henry explains his work inspired by the DAPL. 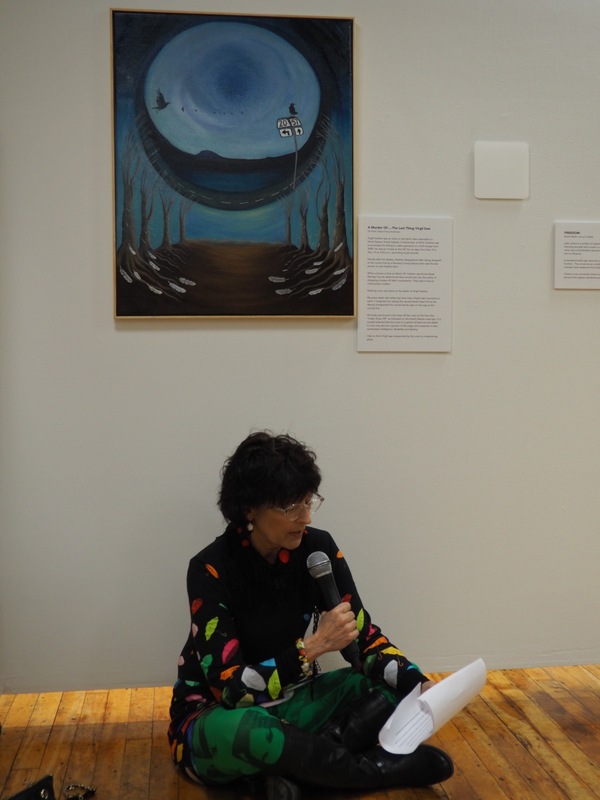 Karen Perry-Anderson tells the story of the death of her friend and Native American artist Virgil Feather which inspired her art. 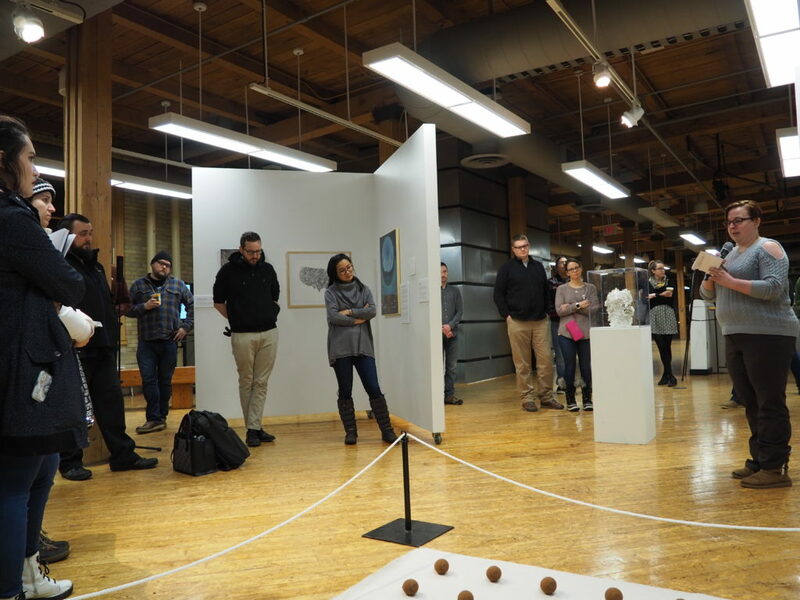 The North Dakota Human Rights Arts Festival hosted a reception at the Plains Art Museum Jan. 24. 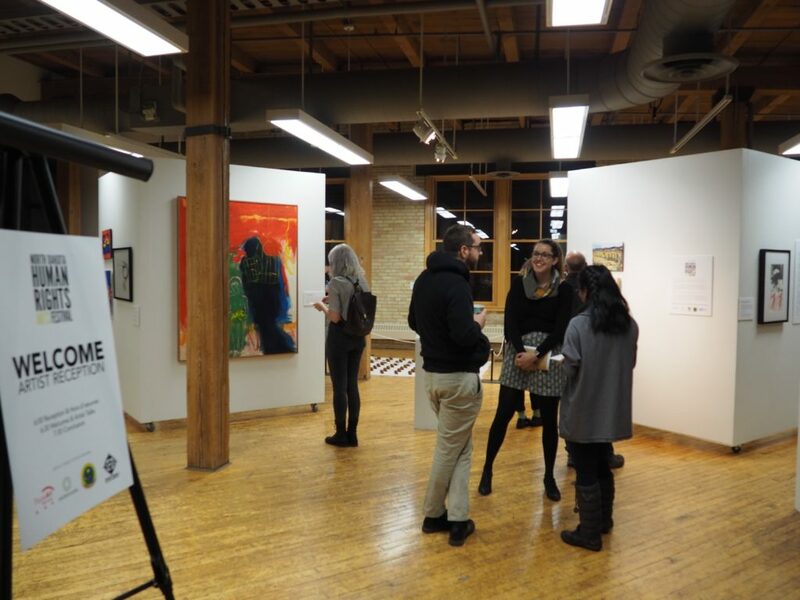 The included works vary in medium, from the written word to ceramics, all created by artists from across the state. Those who visited the Memorial Union Gallery during the last exhibit of the year would recognize a set of three familiar paintings entitled “Brandish” by Beata Weber that are now traveling with this collection. As these works were all created by regional artists, many focused on injustices perpetrated in the recent history of North Dakota. Another artist who chose DAPL as his subject matter presented during the reception. 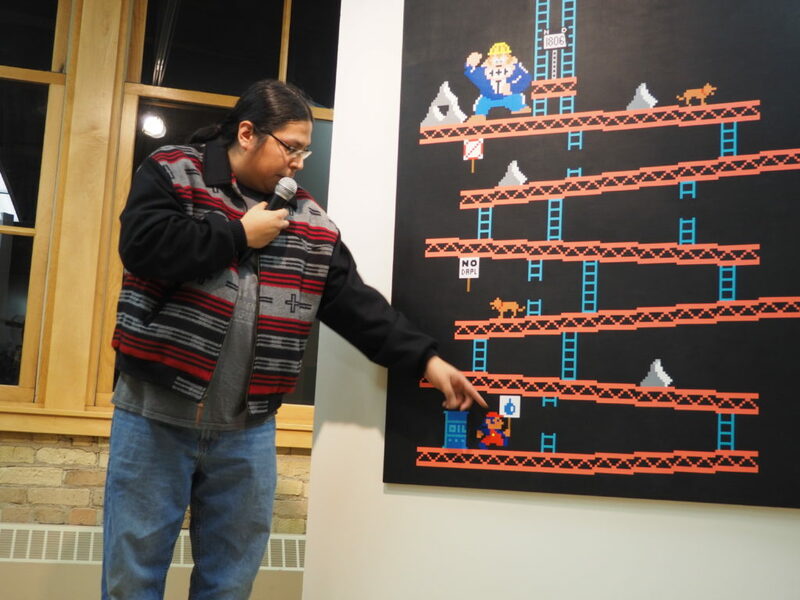 Glendon Henry, a graduate art student in Grand Forks, created the piece “DAPL Kong,” which applied the familiarity of the classic video game “Donkey Kong” and applied it to the DAPL protests. Henry explained that he used pixels in his art because they distort, which is how he feels the history of indigenous peoples of North America has been treated. He pointed out, “The way we all learned indigenous history in school is different than what I was taught and told as an indigenous person myself.” Henry said he hopes his work with pixels helps to abstract the history we were taught or the news we hear and make us more open to hearing the indigenous peoples’ side of the story. Perry-Anderson explained that the member of the Spirit Lake reservation had been incarcerated for failure to pay a former DUI charge in Ramsey County. Due to a car being unavailable to his family members in order to pick him up from the courthouse upon his release, Feather was driven to the county line by a deputy. The wind chill that day was well into the negative 30s and Feather was left to walk into town. 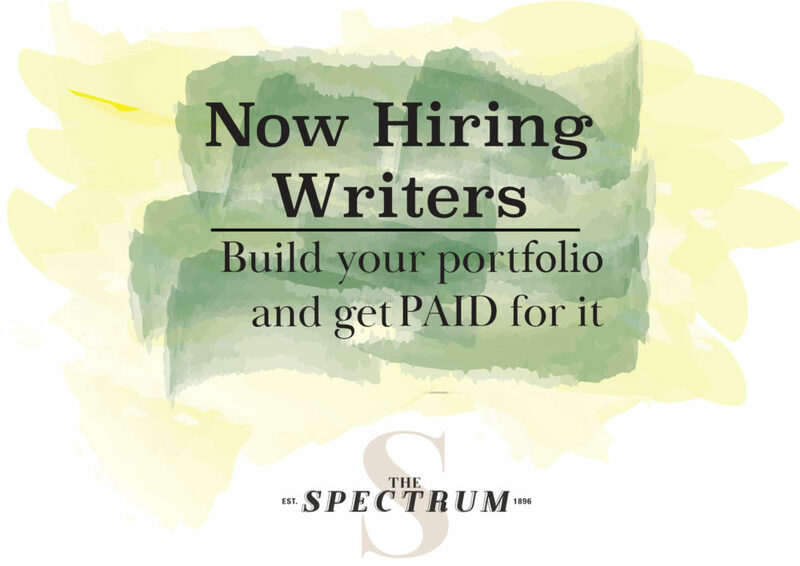 The old man, suffering from Alzheimer’s and possibly the effects of alcohol withdrawal, never made it. His body was discovered in a grove of trees on the side of the road months later. When Ramsey County was confronted, they said they would look into their policy of giving rides to inmates that needed them. To this day, they still give rides and nothing more has been said to Feather’s family. The North Dakota Human Rights Festival traveling exhibition is the result of multiple organizations’ months of hard work. The reception was held in conjunction with the showing of “The Seven” at the Century Theater on campus. To learn more about “The Seven” read Zahra Gaal’s article in the news section of this paper.